The long awaited African leg of our trip was finally here. Kate, Michael and I flew Mumbai to Nairobi, Kenya and waited for Sam to arrive on his flight from Canada. Kate and Sam had never met. It was going to be an awkward seven weeks of they didn’t get along. The Dream Team: Michael, Sam, Hollie and Kate. 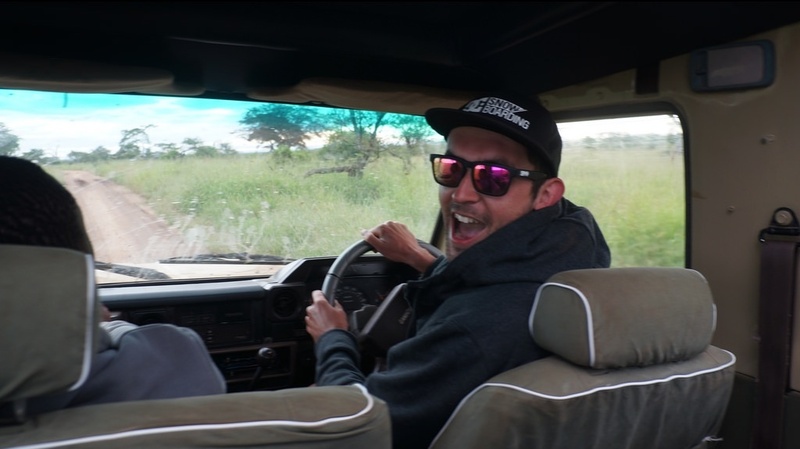 From Nairobi we jumped straight on a bus to Arusha in Tanzania. Arriving just on dusk, we were happy enough to be picked up by a tout named Jacob who took us to a backpackers, showed us an ATM and even had dinner with us. Our accommodation in Arusha was a bit of a laugh. We’re all in one room, Sam in a single bed with his legs poking out the bottom and Kate, Michael and I in two single beds pushed together with me in the crack. It soon became apparent that the weather was colder than anticipated and we may have been a bit unprepared. The next day we bought socks. Jacob was waiting for us when we woke up and after a while, we went with him to organise a safari through the Serengeti National Park, Ngorogoro Crater and Lake Manyara. After a bit of light hearted banter, we were set to leave first thing the next morning with our driver Tony and cook, Moshi. In a nutshell, we had the time of our lives. The nights were cool but the days were scorching. Toni and Moshi were a laugh and a half, the food was amazing and we saw all the animals we could have ever wanted or expected to see. Perfection. To top it all off, Michael and I got engaged. Now how about that. Whoop. Our trucks radiator blew up. Couldn’t have wished for better scenery. 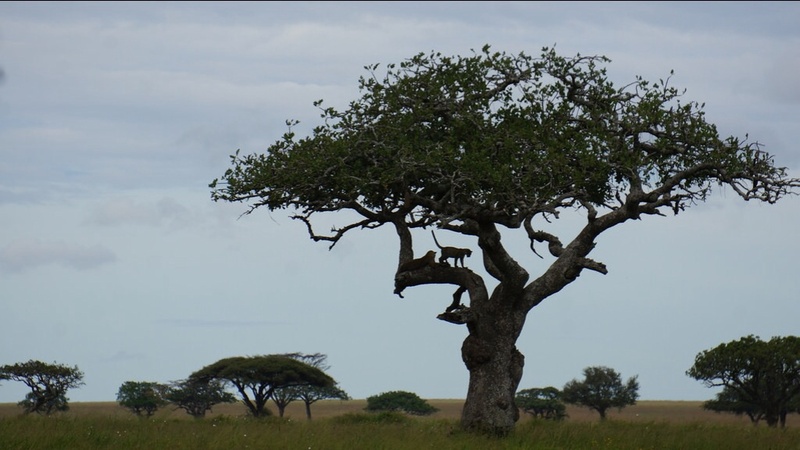 We saw sausage trees, camped with mere cats (and hyenas) and this buffalo had birds up its nose. Sam had a go at driving and did donuts. 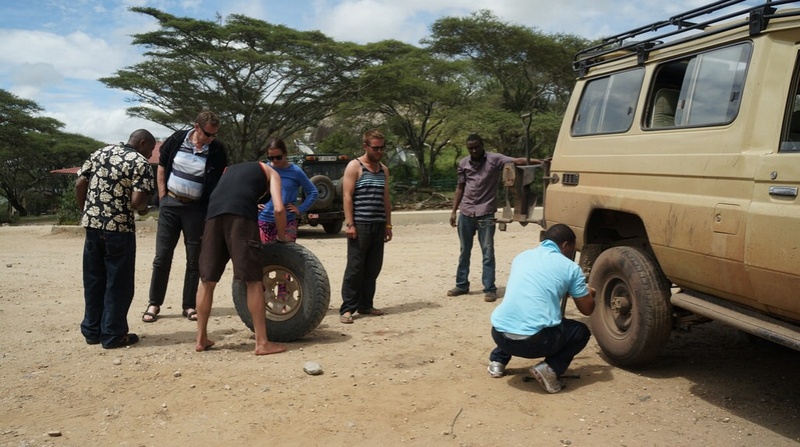 And just for fun, the tuck blew a tyre just as we were about to head back to Arusha. Best time ever. The Dream Team nails it. Once we were back in Arusha we organised a bus ticket to take us to Dar es Salaam. It was one of THE longest bus rides ever. Ever. EVER. But we survived and the next day jumped on the ferry to Zanzibar. We stayed at a lovely hotel right on the water front and what was supposed to be a two night stop over quickly escalated to five nights. If we’d had all the time in the world I’m sure weeks and months could have easily slipped by. One morning we went out on a boat to go snorkelling. The weather packed in so we cut the trip short. While we were walking back to shore, Sams’ foot had an argument with a sea porcupine. Not pretty for poor Sam and no way to fix it apart from rub fresh paw paw on it. Zanzibar is where it’s at. The photos below say it all really – amazingly deep, warm water and sun set after sun set. We had the freshest fish and squid you could wish for, beers on the beach and generally just lived like kings for a short time.